KJIPUKTUK (Halifax) – A coalition of anti poverty activists and community groups wants premier Stephen McNeil to know that current income assistance rates are woefully inadequate. And they need your help in order to get that message across. “We’ve printed up a bunch of postcards, with a message to the premier that we want income assistance rates to go up by 15% this year, and a longer term aim to have the rates meet market basket measures by 2020, which is more or less how much it takes to live a very modest but dignified life,” says Megan MacBride, a community social worker at the North End Community Health Centre in Halifax. 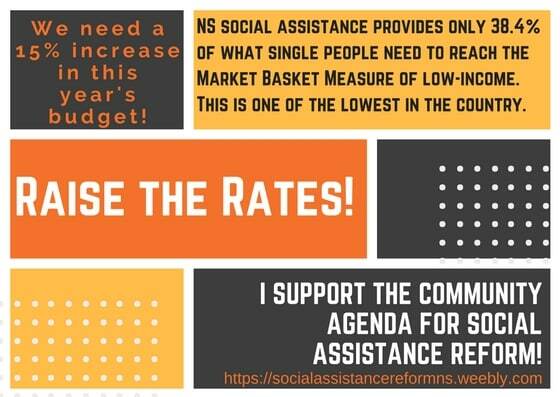 MacBride is a member of the Community Agenda for Social Assistance Reform (CASAR), the same group that has been asking for meaningful input in the secretive welfare transformation project that is reshaping how Community Services delivers income assistance. Although some people send the postcards directly to the premier, which is fine, the plan is to collect the signed postcards and present them to the premier at a future date, says MacBride. “We haven’t set a date yet because there has been so much interest from all over the province. Getting them out and getting people engaged, that’s our focus right now,” she says. “Income assistance rates, taking into account inflation, are actually significantly lower than they were in the eighties. At that time there were opportunities to go back to school, to do volunteer work, to participate in the community. Those opportunities no longer exist, people on income assistance these days are only focused on survival, on how they are going to feed their kids. That’s how our communities are losing out, how all of Nova Scotia is suffering,” MacBride says. Postcards are available at 21 community groups across the province. Email CASAR (socialassistancereform.ns@gmail.com) for a group near you, or to request your own.